JM Florence is the key project unveiled by JM Group in an impeccable site of Greater Noida West. JM housing limited has 15 years of expertise in building elite homes. It’s all commercial and residential constructions are paragon and a mark of urban lifestyle which has rejuvenated the market. Its honest services have created long term associations in the market, which makes it an inspiring group. JM Florence has 2/3 and 4 BHK pristine apartments in a green ambience of 7 acres, with a view of landscape. This architectural marvel has set standards of the phenomenal housing. It has 80% open area and is well connected to the head locations of Delhi NCR with metro, buses, autos etc. It is near to 130 m wide road and has a walking distance to proposed metro station. It is 2.5 Km away from metro station, 2.5 km from Sai Mandir, 4 Km from Fortis Hospital and is 10 minutes’ drive away from Noida Sector – 18. It has several class amenities such as walking & Jogging Track, visitor parking & reserved parking, round the clock high tech security, 100 percent power backup, rain water harvesting, uninterrupted water supply, firefighting arrangements, landscaped gardens, kids park, high speed elevators, swimming pool, gymnasium/fitness centre, club house, bank & ATM, indoor games facility, badminton court etc. The project has Vastu compliant design and earthquake resistant structure, which is RCC shear wall structure. All rooms have flooring of vitrified tiles & master bedroom has special wooden laminated flooring. Toilets, balconies and kitchen have ceramic tiles. Corridor, lift lobbies and staircases have marble stones. Main entrance door and internal doors are framed in hard wood with designer panel. External windows and door are framed with powder coated aluminium glazing. 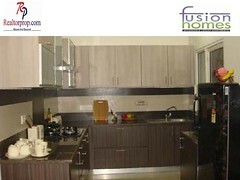 Kitchen has granite working platform, stainless steel sink and RO system. Internal walls are plastered and painted through oil bound distemper with white shades. Drawing/dining & bedrooms have POP puning & cornices and there is cupboard in all bedrooms. High quality electrical fitting and enough power points are available. RealtorProp has ultimate offers in this undertaking and pricelist of apartment starts from just Rs. 32.25 lacs. It also has a special 20-20 payment scheme plan. RealtorProp is potentate group in Delhi NCR, which provides all property related solutions. It has many exclusive deals in residential as well as commercial projects. Some of its popular dealing areas include real estate in Greater Noida West, Yamuna expressway, Indirapuram, Greater Noida, Vaishali.